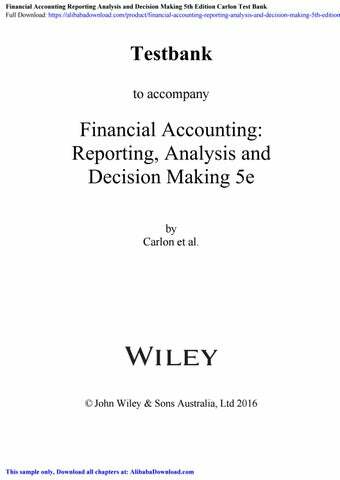 Financial Accounting: Reporting, Analysis and Decision Making 5e by Carlon et al. 1. The provision of accounting information within the business entity is referred to as: a. financial accounting. *b. management accounting. c. commercial accounting. d. public accounting. Answer: b Learning objective 1.1 – Explain the business context and the need for decision making. Feedback: The provision of information within the business entity is referred to as management accounting. 2. The accounting process includes which steps: *a. identifying, measuring, recording and communicating. b. identifying, recording, communicating and justifying. c. measuring, adjusting, recording and communicating. d. measuring, evaluating, recording and communicating. Answer: a Learning objective 1.2 – Define accounting, describe the accounting process and define the diverse role of accountants. Feedback: The four steps of the accounting process are identifying, measuring, recording and communicating relevant transactions and events. 3. The sole trader form of business organisation: a. must have at least two owners. b. combines business records with the personal records of the owner. *c. results in the owner having personal liability for the debts of the business. d. is a separate legal entity. Answer: c Learning objective 1.3 – Explain the characteristics of the main forms of business organisation. Feedback: Under the sole trader business structure the owner of the business has no separate legal existence from the business. The owner of the business is therefore personally liable for the debts of the business. 4. The majority of business in Australia is transacted by: a. sole traders. b. partnerships. c. government units. *d. companies. Answer: d Learning objective 1.3 – Explain the characteristics of the main forms of business organisation. Feedback: The majority of business in Australia is transacted by companies. 5. One advantage of the company form of business structure is that: a. it has limited life. b. the liability of the owners is unlimited. *c. it provides the owners with shared control. d. it makes higher profits. Answer: c Learning objective 1.3 – Explain the characteristics of the main forms of business organisation. Feedback: A company is a separate legal entity and has an indefinite life that is independent of the shareholders. Shareholders of most companies have limited liability for the debts of the company and if there is more than one director, the decision making is usually a shared responsibility. 6. A company has the following set of characteristics: a. provides owners with shared control, simple to establish. b. simple to set up, owner retains control. *c. complex to set up, provides owners with shared control. d. provides owners with shared control, unlimited liability. Answer: c Learning objective 1.3 – Explain the characteristics of the main forms of business organisation. Feedback: There are initial costs associated with incorporation for a company and then ongoing fees and regulations to comply with. If there is more than one director, then the decision making is usually a shared responsibility. Shareholders of most companies have limited liability for the debts of the company. 7. Which of the following statements is false? *a. The definition of reporting entity forms the foundation of the Conceptual Framework as all other elements flow from it. b. A reporting entity must prepare general purpose financial reports that comply with accounting standards. c. Political or economic importance is a factor in determining whether an entity is a reporting entity. d. The objective of general purpose financial reports is to provide information that is useful to existing and potential investors, creditors and other external users. Answer: a Learning objective 1.4 – Understand the Conceptual Framework and the purpose of financial reporting. Feedback: The objective of general purpose reporting forms the foundation of the Conceptual Framework. If we know why we need to report then who needs to report can be determined and then what and how the information is to be reported follow. All the other statements are correct. 8. The purpose of financial reports is to: *a. provide information for decision making. b. report profit. c. pay tax to the ATO. d. report to the bank. Answer: a Learning objective 1.4 – Understand the Conceptual Framework and the purpose of financial reporting. Feedback: The purpose of financial reports is to provide information for decision making. 9. Who of the following would not be considered an internal user of accounting data for the XYZ Company Ltd? a. the chief executive officer of the company. b. a production manager. c. the company's sales manager. *d. a share investor. Answer: d Learning objective 1.5 – Identify the users of financial reports and describe users' information needs. Feedback: Internal users of accounting information are managers who plan, organise and control the business. 10. Which of the following user groups would use accounting information to determine whether an advertising proposal will be cost effective? a. investors in shares. *b. marketing managers. c. creditors. d. chief financial officer. Answer: b Learning objective 1.5 – Identify the users of financial reports and describe users' information needs. Feedback: Evaluating an advertising proposal would occur internally and would typically be undertaken in the marketing department. 11. Which of the following user groups is an internal user of accounting information for the XYZ Company Ltd? a. auditors from the Australian Taxation Office. *b. management of XYZ Company. c. creditors of XYZ Company. d. customers of XYZ Company. Answer: b Learning objective 1.5 – Identify the users of financial reports and describe users' information needs. Feedback: Managers are internal users of accounting information. 12. Which of the following users would not be considered an internal user of accounting data for a company? a. the chief executive officer of the company. b. the financial director of the company. *c. a creditor of the company. d. a salesperson employed by the company. Answer: c Learning objective 1.5 – Identify the users of financial reports and describe users' information needs. Feedback: Creditors are an external resource provider. 13. Which of the following is not a principal type of business activity? a. operating. b. investing. c. financing. *d. delivering. Answer: d Learning objective 1.5 – Identify the users of financial reports and describe users' information needs. Feedback: The three main types of business activities are operating, investing and financing. Delivery is a function of operating activities. 14. Borrowing money is an example of a/an: a. marketing activity. *b. financing activity. c. investing activity. d. operating activity. Answer: b Learning objective 1.5 – Identify users of financial reports and describe users' information needs. Feedback: Borrowing money is one of the two main sources of outside funds for companies. The other is the issue of shares to investors. 15. Buying assets required to operate a business is an example of a/an: a. advertising activity. b. financing activity. *c. investing activity. d. operating activity. Answer: c Learning objective 1.5 – Identify the users of financial reports and describe users' information needs. Feedback: Investing activities involve purchasing resources an entity needs in order to operate. 16. The activity involved with employing the resources of the business to generate revenues is: a. accounting. b. financing. c. investing. *d. operating. Answer: d Learning objective 1.5 – Identify the users of financial reports and describe users' information needs. Feedback: Once a business has acquired resources it needs to employ those resources to generate revenues from operating activities. 17. Buying and selling products are examples of: *a. operating activities. b. investing activities. c. financing activities. d. delivering activities. Answer: a Learning objective 1.5 – Identify the users of financial reports and describe users' information needs. Feedback: Buying and selling products are examples of operating activities. 18. The common characteristic possessed by all assets is: a. long life. b. great monetary value. c. tangible nature. *d. future economic benefit. Answer: d Learning objective 1.6 – Identify the elements of each of the four main financial statements. Feedback: An asset is defined in the Conceptual Framework as a resource controlled by the entity as a result of past events from which future economic benefits are expected. 19. Dividends paid: a. increase assets. b. increase expenses. c. decrease revenues. *d. decrease retained earnings. Answer: d Learning objective 1.6 – Identify the elements of each of the four main financial statements. Feedback: Retained earnings refers to company profits that have been accumulated and not distributed as dividends to shareholders. 20. Resources owned by a business are referred to as: a. equity. b. liabilities. *c. assets. d. revenues. Answer: c Learning objective 1.6 – Identify the elements of each of the four main financial statements. Feedback: Assets are defined in the Conceptual Framework as a resource controlled by the entity as a result of past events from which future economic benefits are expected. 21. The financial statement that summarises the changes in retained earnings for a specific period of time is the: a. statement of financial position. b. income statement. c. statement of cash flows. *d. statement of changes in equity. Answer: d Learning objective 1.6 – Identify the elements of each of the four main financial statements. Feedback: The statement of changes in equity reports profit for the period and transactions with owners of the company such as share capital movements and dividends. The statement of changes in equity explains the link between the income statement and the statement of financial position. 22. Retained earnings at the end of the period is equal to: a. retained earnings at the beginning of the period plus profit minus liabilities. *b. retained earnings at the beginning of the period plus profit minus dividends paid. c. profit plus total assets. d. assets plus liabilities. Answer: b Learning objective 1.6 – Identify the elements of each of the four main financial statements. Feedback: Retained earnings refers to company profits that have been accumulated and not distributed as dividends to shareholders. 23. A company's policy toward dividend distributions and growth could best be determined by examining the: a. statement of financial position. b. income statement. *c. statement of changes in equity. d. statement of cash flows. Answer: c Learning objective 1.6 – Identify the elements of each of the four main financial statements. Feedback: Shareholders and other external users can see how much profit has been distributed as dividends by reading the statement of changes in equity. 24. An income statement: a. summarises changes in retained earnings for a specific period of time. b. reports the changes in assets, liabilities, and equity for a specific period of time. c. reports the assets, liabilities, and equity at a specific date. *d. presents the revenues and expenses for a specific period of time. Answer: d Learning objective 1.6 – Identify the elements of each of the four main financial statements. Feedback: The purpose of the income statement is to report the success or failure of the entity's operations for a period of time. 25. If retained earnings increases from the beginning of the year to the end of the year, then: a. profit is less than dividends paid. b. dividends paid are greater than profit. c. additional investments are less than losses. *d. profit is greater than dividends paid. Answer: d Learning objective 1.6 – Identify the elements of each of the four main financial statements. Feedback: Profits increase equity and are accumulated into retained earnings. Dividends reduce retained earnings. 26. The statement of changes in equity does not show: a. the beginning balance of retained earnings. *b. total revenue. c. the amount of dividends paid. d. the ending balance of retained earnings. Answer: b Learning objective 1.6 – Identify the elements of each of the four main financial statements. Feedback: Total revenue is shown in the Income Statement. 27. Johnny's Car Repairs had total assets of $60,000 and total liabilities of $40,000 at the beginning of the year. During the year the business recorded $100,000 in revenues, $55,000 in expenses, and dividends of $10,000 were distributed. Equity at the end of the year is: *a. $55,000. b. $35,000. c. $65,000. d. $45,000. Answer: a Learning objective 1.6 – Identify the elements of each of the four main financial statements. Feedback: Beginning equity was $20,000 ($60,000 - $40,000), profit for the year is $45,000 ($100,000 - $55,000) therefore $20,000 + $45,000 - $10,000 = $55,000. 28. Johnny's Car Repairs had total assets of $60,000 and total liabilities of $40,000 at the beginning of the year. During the year the business recorded $100,000 in revenues, $55,000 in expenses, and dividends of $10,000 were distributed. Profit reported by Johnny's Car Repairs for the year was: a. $35,000 *b. $45,000 c. $20,000 d. $90,000 Answer: b Learning objective 1.6 – Identify the elements of each of the four main financial statements. Feedback: Profit is $45,000 ($100,000 - $55,000). 29. If total liabilities increased by $25,000 and equity increased by $5,000 during a period of time, then total assets: a. decrease by $20,000. b. increase by $20,000. c. increase by $25,000. *d. increase by $30,000. Answer: d Learning objective 1.6 – Identify the elements of each of the four main financial statements. Feedback: Assets = Liabilities + Equity therefore assets = $25,000 + $5,000. 30. If total liabilities decreased by $14,000 during a period of time and equity increased by $6,000 during the same period, then the change in total assets is: a. an increase of $14,000. b. an increase of $20,000. *c. a decrease of $8,000. d. an increase of $8,000. Answer: c Learning objective 1.6 – Identify the elements of each of the four main financial statements. Feedback: Assets = Liabilities + Equity therefore assets = - $14,000 + $6,000 = $8,000. 31. The statement of financial position: a. summarises the changes in retained earnings for a specific period of time. b. reports changes in assets, liabilities, and equity over a period of time. *c. reports assets, liabilities, and equity at a specific point in time. d. presents revenues and expenses for a specific period of time. Answer: c Learning objective 1.6 – Identify the elements of each of the four main financial statements. Feedback: The statement of financial position reports assets and claims to those assets at a specific point in time. 32. Which of the following financial statements is concerned with a business at a point in time? *a. statement of financial position. b. income statement. c. statement of changes in equity. d. statement of cash flows . Answer: a Learning objective 1.6 – Identify the elements of each of the four main financial statements. Feedback: The statement of financial position reports assets and claims to those assets at a specific point in time. 33. Liabilities of a company are amounts or obligations owed to: a. investors. b. owners. *c. creditors. d. shareholders. Answer: c Learning objective 1.6 – Identify the elements of each of the four main financial statements. Feedback: Claims of creditors are called liabilities. 34. Equity can be described as claims of a. creditors on total assets. *b. owners on total assets. c. customers on total assets. d. auditors on total assets. Answer: b Learning objective 1.6 – Identify the elements of each of the four main financial statements. Feedback: Claims of owners are called equity or shareholders' equity. 35. Equity: a. is always equal to cash on hand. b. is equal to liabilities plus assets. *c. includes retained earnings and issued shares. d. is shown on the income statement. Answer: c Learning objective 1.6 – Identify the elements of each of the four main financial statements. Feedback: Equity of a company comprises two parts - share capital and retained earnings. 36. Retained earnings represents: a. the shareholders' claim on total assets. b. the amount of cash held by the business. c. the total of revenue for the period. *d. the amount of profit held in the company for future use. Answer: d Learning objective 1.6 – Identify the elements of each of the four main financial statements. Feedback: Retained earnings are the accumulated profits of the company that have not been distributed as dividends to shareholders and is available for future expansion. 37. An annual report includes all of the following except: a. chairman and directors' reports. b. notes to the financial statements. c. an auditor's report. *d. detailed salary package of clerical staff. Answer: d Learning objective 1.6 – Identify the elements of each of the four main financial statements. Feedback: An annual report would not contain detailed information regarding the salaries or clerical staff. This type of information is for internal decision making only and is not available for external users. 38. The information needed to determine whether a company is using accounting methods similar to those of its competitors would be found in the: a. auditor's report. b. statement of financial position. c. directors' report. *d. notes to the financial statements. Answer: d Learning objective 1.6 – Identify the elements of each of the four main financial statements. Feedback: The notes to the financial statements include descriptions of the accounting policies and methods used in preparing the statements. 39. In the annual report, where would a financial statement reader find out if the company's financial statements give a true and fair view of its financial position and operating results? a. notes to the financial statements. b. directors' report. c. statement of financial position. *d. auditor's report. Answer: d Learning objective 1.6 – Identify the elements of each of the four main financial statements. Feedback: It is the auditor's responsibility to state whether or not the financial statements provide a true and fair view of the company's financial position and operating results. 40. A company's reviews of operations, dividend details and information about important events after the date of the financial statements are all found in the: a. auditor's report. *b. directors' report. c. notes to the financial statements. d. income statement. Answer: b Learning objective 1.6 – Identify the elements of each of the four main financial statements. Feedback: Operational review and information relating to dividends, and post balance day events is included in the directors' report. 41. Categories usually found on the face of a classified statement of financial position include: *a. assets, liabilities, equity. b. revenues, expenses, profit. c. cash receipts, cash payments. d. retained earnings dividends. Answer: a Learning objective 1.6 – Identify the elements of each of the four main financial statements. Feedback: The main sections in the statement of financial position are assets, liabilities and equity. 42. Cash is usually classified as: a. revenue. b. an expense. c. retained earnings. *d. a current asset. Answer: d Learning objective 1.6 – Identify the elements of each of the four main financial statements. Feedback: Cash is usually classified as a current asset. 43. Included among current liabilities on a classified statement of financial position would be: a. cash. b. property, plant and equipment. c. deferred tax assets. *d. short-term borrowings. Answer: d Learning objective 1.6 – Identify the elements of each of the four main financial statements. Feedback: Short term borrowings are debts that are due to be settled within 12 months and are included as current liabilities in a classified statement of financial position. 44. Which financial statement would indicate whether the company relies on debt or equity to finance its assets? a. statement of cash flows b. statement of changes in equity c. income statement *d. statement of financial position Answer: d Learning objective 1.6 – Identify the elements of each of the four main financial statements. Feedback: The statement of financial position reports assets and claims to those assets at a specific point in time. The claims to the assets are of two types: creditors (debts) and equity (claims by the owner/s). 45. The Financial Reporting Council (FRC) is responsible to the government for: *a. the broad oversight of the accounting standard-setting process. b. urgent accounting issues. c. development of a conceptual framework for financial reporting. d. taxation issues for companies. Answer: a Learning objective 1.7 – Describe the financial reporting environment. Feedback: The FRC is the body that advises the Commonwealth Government on the accounting standard-setting and auditing standard-setting processes. 46. Accounting standards issues by the Australian Accounting Standards Board (AASB) are consistent with those issued by the: a. Financial Reporting Council (FRC). b. Australian Taxation Office. c. Urgent Issues Group. *d. International Accounting Standards Board. Answer: d Learning objective 1.7 – Describe the financial reporting environment. Feedback: The accounting standards issued by the Australian Accounting Standards Board (AASB) are substantially consistent with those issued by the International Accounting Standards Board. 47. Which of the following statements is false? a. GAAP in Australia is a combination of accounting standards and interpretations as well as concepts and principles that have developed over time. b. The Australian Securities and Investments Commission monitors a company's compliance with accounting standards and the Corporations Act. *c. Members of the FRC are appointed by the Australian Accounting Standards Board. d. Listed public companies must comply with Australian Securities Exchange listing rules which, for financial reporting purposes, focus on disclosure of information. Answer: c Learning objective 1.7 – Describe the financial reporting environment. Feedback: Members of the FRC appoint members of the AASB. Members of the FRC are appointed by the Commonwealth Treasurer and include key stakeholders from the business community, the professional accounting bodies, governments and regulatory agencies. All other statements are correct. 48. The going concern assumption is inappropriate when: a. the business is just starting up. *b. liquidation appears likely. c. market values are higher than costs. d. the business is organised as a sole trader. Answer: b Learning objective 1.8 – Explain the accounting concepts, principles, qualitative characteristics and constraints underlying financial statements. Feedback: The going concern principle states that the business will remain in operation for the foreseeable future. 49. The accounting principle which assumes that a business will remain in operation for the foreseeable future is the: a. monetary principle. b. accounting entity concept. c. full disclosure principle. *d. going concern principle. Answer: d Learning objective 1.8 – Explain the accounting concepts, principles, qualitative characteristics and constraints underlying financial statements. Feedback: The going concern principle states that the business will remain in operation for the foreseeable future. 50. The going concern principle assumes that the business: a. will be liquidated in the near future. b. will be purchased by another business. c. is in a growth industry. *d. will remain in operation for the foreseeable future. Answer: d Learning objective 1.8 – Explain the accounting concepts, principles, qualitative characteristics and constraints underlying financial statements. Feedback: The going concern principle assumes the business will remain in operation for the foreseeable future. 51. The accounting entity concept states that each entity: *a. can be separately identified and accounted for. b. cannot reasonably report all of its activities in financial statements. c. cannot distinguish events of the business from its owners. d. will remain in operation for the foreseeable future. Answer: a Learning objective 1.8 – Explain the accounting concepts, principles, qualitative characteristics and constraints underlying financial statements. Feedback: The accounting entity concept states that every entity can be separately identified and accounted for. 52. What are the qualitative characteristics that enhance the decision usefulness of relevant information faithfully represented in financial statements? a. Generally accepted accounting principles (GAAP). b. Accounting entity concept and the cost principle. c. Comparability, verifiability and understandability. *d. Comparability, verifiability, understandability and timeliness. Answer: d Learning objective 1.8 – Explain the accounting concepts, principles, qualitative characteristics and constraints underlying financial statements. Feedback: Information is more relevant and reliability when it is comparable, verifiable and understandable. Information must also be available to users before it ceases to be relevant. 53. The accounting period concept states that: a. the business will remain in operation for the foreseeable future. *b. the life of a business can be divided into artificial time periods. c. every business entity can be separately identified and accounted for. d. only those events that can be expressed in money may be included in the accounting records. Answer: b Learning objective 1.8 – Explain the accounting concepts, principles, qualitative characteristics and constraints underlying financial statements. Feedback: The accounting period concept states the life of a business can be divided into artificial periods and that useful reports covering those periods can be prepared. 54. The cost principle requires assets to be initially recorded at: a. market value. *b. the amount paid for them. c. selling price. d. liquidation value. Answer: b Learning objective 1.8 – Explain the accounting concepts, principles, qualitative characteristics and constraints underlying financial statements. Feedback: The cost principle states that all assets are initially recorded in the accounts at their purchase price or cost. 55. Accounting information is relevant if it: *a. would influence a business decision. b. makes no difference to a business decision. c. is not material to a business decision. d. is immaterial. Answer: a Learning objective 1.8 – Explain the accounting concepts, principles, qualitative characteristics and constraints underlying financial statements. Feedback: Accounting information is considered to be relevant if it is capable of making a difference in a business decision. 56. Comparability of financial information results when: a. different entities use different accounting principles. *b. different entities use the same accounting principles. c. that information can be depended upon to be relevant. d. the financial reports are understandable. Answer: b Learning objective 1.8 – Explain the accounting concepts, principles, qualitative characteristics and constraints underlying financial statements. Feedback: In accounting, comparability is achieved when an entity uses the same or consistent accounting principles each year and different entities use the same accounting principles. 57. Liquidity ratios measure: *a. the ability of a company to pay its obligations that are due within the next year or operating cycle. b. the operating success of a company for a period of time. c. the ability of a company to survive over a long time. d. the extent to which a company's assets are financed by debt. Answer: a Learning objective 1.9 – Calculate and interpret ratios for analysing an entity's profitability, liquidity and solvency. Feedback: Liquidity ratios measure the short-term ability of the entity to pay its obligations that are due within the next year or operating cycle. 58. The return on assets ratio is calculated by: *a. dividing profit by average assets. b. dividing profit by total assets at the end of a period. c. dividing total assets at the end of a period by profit. d. dividing average assets by profit. Answer: a Learning objective 1.9 – Calculate and interpret ratios for analysing an entity's profitability, liquidity and solvency. Feedback: Return on assets is calculated by dividing profit by average assets. 59. Solvency measures the ability of a business to: *a. repay its long-term debts at maturity and interest as it becomes due. b. meet its short-term obligations. c. pay its obligations that will fall due within the operating cycle. d. turn its inventory into cash. Answer: a Learning objective 1.9 – Calculate and interpret ratios for analysing an entity's profitability, liquidity and solvency. Feedback: Solvency is an entity's ability to pay interest as it becomes due and to repay the debt at maturity. 60. A debt to total assets ratio of 80%: a. means that 20% of investment in assets has been provided by lenders. *b. is undesirable for creditors . c. is desirable for creditors. d. is likely to be supported by cyclical entities that have fluctuating profits, such as many high-tech companies. Answer: b Learning objective 1.9 – Calculate and interpret ratios for analysing an entity's profitability, liquidity and solvency. Feedback: A high debt to total asset ratio is undesirable to creditors as there is less chance of them receiving debt repayment from shareholders' funds if the company goes into liquidation. Generally, companies with stable profits can support high levels of debt. Exercises 61. Indicate in the spaces provided whether each item would appear on the statement of cash flows as an: (O) operating activity, (I) investing activity, or (F) financing activity. Answer below. Learning objective 1.6 – Identify the elements of each of the four main financial statements. *Note: Jerry Cole, Dental Practice, is structured as a Sole Trader. Unlike a company the liability for the debts of the business is unlimited for the sole trader. Therefore the equity of the owner is reported as a single item – Owner’s equity and distributions to the owner are called “drawings” not dividends. Answer below. Learning objective 1.6 â&#x20AC;&#x201C; Identify the elements of each of the four main financial statements. Answer below. Learning objective 1.6 – Identify the elements of each of the four main financial statements. a. b. c. d. e. f.
67. The directors of Tomas Sanchez Ltd were reviewing the company business activities at the end of the year (2015) and decided to prepare a Statement of Changes in Equity. At the beginning of the year company assets were $500,000, liabilities were $150,000, and share capital was $100,000. Profit for the year was $420,000. Dividends paid of $220,000 were paid during the year. Prepare a Statement of Changes in Equity for Tomas Sanchez Ltd. Answer below. Learning objective 1.6 â&#x20AC;&#x201C; Identify the elements of each of the four main financial statements. 69. From the following list of selected items taken from the records of Downing Clinic Ltd, identify those that would appear on the Statement of Financial Position. a. b. c. d. e.
Answer: a, c, e, f, g, i. Learning objective 1.6 â&#x20AC;&#x201C; Identify the elements of each of the four main financial statements. 70. One item is omitted in each of the following summaries of Statement of Financial Positions and Income Statements for three different companies, X Ltd, Y Ltd, and Z Ltd. Determine the amounts of the missing items, identifying each company by letter. Answer: a. $18,000 b. $58,000 c. $34,000 Learning objective 1.6 – Identify the elements of each of the four main financial statements. Answer: b, c, d, f, g. Learning objective 1.6 – Identify the elements of each of the four main financial statements. Answer below. Learning objective 1.6 â&#x20AC;&#x201C; Identify the elements of each of the four main financial statements. 1. 2. 3. 4. 5. Answer below. Learning objective 1.6 â&#x20AC;&#x201C; Identify the elements of each of the four main financial statements. 1. 2. 3. 4. 5. 6. 7. 8. 75. At the beginning of the year, Wise Company Ltd had total assets of $700,000 and total liabilities of $300,000. Answer the following questions viewing each situation as being independent of the others. 1. If total assets increased $225,000 during the year, and total liabilities decreased $100,000, what is the amount of equity at the end of the year? 2. During the year, total liabilities increased $315,000 and Equity decreased $130,000. What is the amount of total assets at the end of the year? 3. If total assets decreased $60,000 and Equity increased $180,000 during the year, what is the amount of total liabilities at the end of the year? Answer below. Learning objective 1.6 – Identify the elements of each of the four main financial statements. 1. Assets - Van, Cash, Cleaning Supplies, Accounts Receivable, Equipment. 2. Liabilities - Accounts Payable, Loan Payable. 3. Equity - Share capital, Retained earnings. 78. Compute the missing amount in each category of the accounting equation. Assets $260,000 $178,000 $ ? Completion statements 79. Presented below are the qualitative characteristics of information contained in general-purpose financial reports. a. relevance b. reliability c. comparability d. understandability Identify the qualitative characteristic that fits the statement below. 1. Information in general-purpose financial reports should be_____________ to users who have the proficiency to comprehend the significant accounting practices. 2. Financial report information is ______________ when different entities use the same accounting principles. 3. Accounting information is _____________ if it would make a difference in a business decision. 4. Information that can be depended on and without undue error is said to be _________. Answer below. Learning objective 1.8 â&#x20AC;&#x201C; Explain the accounting concepts, principles, qualitative characteristics and constraints underlying financial statements. 1. 2. 3. 4. 80. Complete the following statements: 1. Answer below. Learning objective 1.3, 1.5, 1.6, 1.8. 1. 2. 3. 4. 5. Matching 81. Match the items below by entering the appropriate code letter in the space provided. 1. Financial information is collected quickly so that it does not lose its relevance. 2. Consumed assets or services. 3. Ownership is limited to one person. 4. Officers and others who manage the business. 5. Creditor claims against the assets of the business. 6. An organisation that produces listing rules that companies must comply with. 7. A report prepared by directors that presents audited financial information. 8. A section of the annual report that presents management’s views. ____ 10. Accumulated profit that has not been distributed as dividends to owners. Answer below. Learning objective 1.8 – Explain the accounting concepts, principles, qualitative characteristics and constraints underlying financial statements. 1. 2. 3. 4. 5. Identify the basic concept or principle that is described below. ____ 1. The economic life of a business can be divided into artificial time periods. ____ 2. The business will continue in operation long enough to carry out its existing objectives. ____ 3. Assets should be recorded at their cost. ____ 4. Every entity can be separately identified and accounted for. ____ 5. Circumstances and events that make a difference to financial statement users should be disclosed. ____ 6. Only transaction data that can be accurately expressed in terms of money should be included in the accounting records. Short-answer/essay questions 83. Explain the four steps in the accounting process. Answer below. Learning objective 1.2 Define accounting, describe the accounting process and define the diverse role of accountants. The accounting cycle consists of four steps. First, all relevant economic events (or transactions) must be identified. Relevant economic benefits are those that affect the assets and or liabilities of the business. Second, all transactions that have been identified in the first step have to be quantified in monetary terms. The third step is recording the transactions. This step must include analysing, recording, classifying and summarising transactions. Finally once these three steps have been performed the results can be communicated to users by preparing accounting reports, including an income statement, statement of financial position, statement of cash flows and statement of changes in equity.